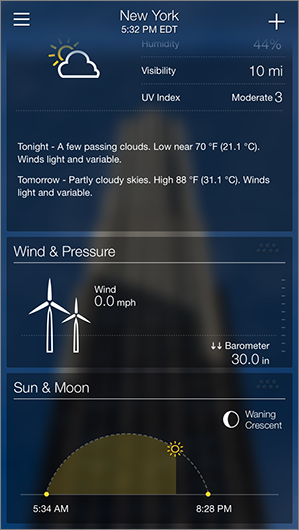 Looking for a replacement for your boring weather app? Check out the Yahoo Weather app. It's gorgeous, intuitive, and powered by the reliable data from Weather Underground. 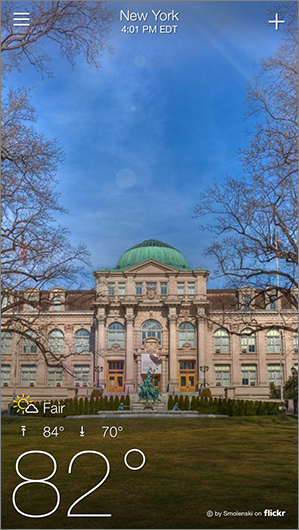 See the weather with beautiful, full-screen photos of your location and weather conditions. Get reliable local and global weather updated moment-by-moment by Weather Underground. Get the basics for the day right up front. See the day's high, low, and current temperatures along with the up-to-date condition, all without scrolling. Swipe down to see your 5 or 10-day forecast. Get precipitation data, humidity, wind speed, UV index, and much more. See emergency weather alerts and set up personalized weather notifications. Radar - Explore weather conditions in a browsable radar map. Moon phases - Get to know them with a quick glance. 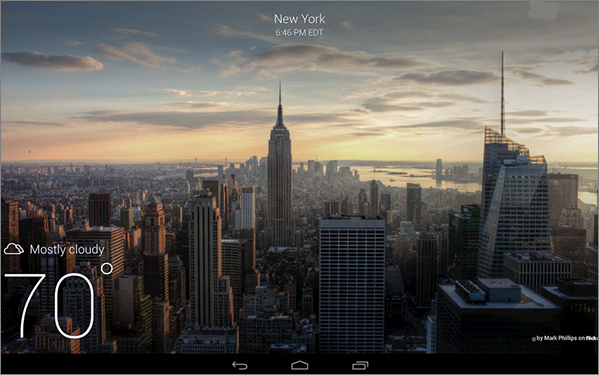 You can find all these great features on your Android and iOS tablet or phone.